Skate wheel conveyors are used to convey lightweight products in standalone applications or system solutions. They are versatile, maintain product orientation, convey product freely and efficiently. Available in aluminum or galvanized steel. 1-3/8” X 18 ga. roller conveyors are used in integrated systems or temporary operations to convey lightweight products in multiple applications. The conveyor is very adaptable and available in aluminum and galvanized steel rollers and frames. 1.9” X 16 ga. roller conveyors are used in permanent installations in multiple light to medium duty applications in manufacturing and distribution. Multiple bearing and frame configurations are available to help you meet your system requirements. Mallard’s gravity conveyor is used in a variety of applications – affordably and reliably moving cartons and totes for warehousing, assembly and shipping. 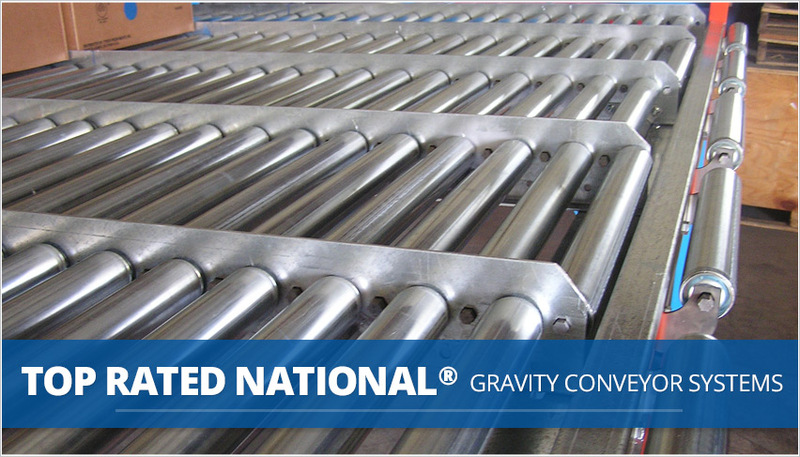 Gravity flow sections can be level for push-assisted applications or minimally sloped to flow with gravity.